While we were in NYC, I knew that one of our morning had to consist of pancakes. And I knew that if we were only going to have 1 breakfast blowout, they had to be the best pancakes in NYC. A little bit of Googling led me to Bubby’s NYC, recommended as one of the best breakfast places, and in particular, had the best pancakes in NYC. A quick look at the menu had me sold! We took the subway from Penn Station to Franklin Street, which is the closest station to Bubby's NYC, with Paul complaining the whole way about why we couldn’t get pancakes at one of the hundreds of other breakfast places near our hotel that didn’t involve a subway ride. Seriously, if any of you bloggers out there have boyfriends who understand the importance of an Instagrammable breakfast, let me know how you got them trained! After wandering around the building about 5 times because we just couldn’t find the door (yes, we’re actually that stupid sometimes) we managed to get in and seated straight away. 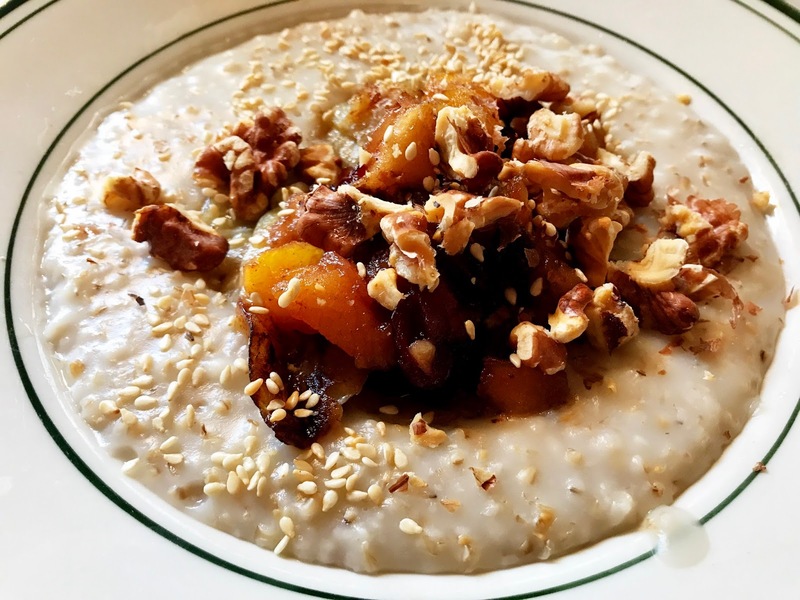 If you’re an indecisive person then breakfast at Bubby’s NYC is going to require some serious stress and planning on your part, because the menu is just so flippin’ amazing that you’ll never be able to make a choice off the bat. I understand why it's got a name for the best breakfast place in NYC now! Oh, and not only is the menu amazing, everything is so Instagrammable too. It’s literally a bloggers heaven and hell all at once! I opted for a breakfast tea (because how could I call myself British if I made any other choice at breakfast time?) along with Autumn oatmeal. I mean, with a title like that how could I choose anything else? It came with caramelised banana, spiced apple, dried fruit, toasted walnuts, brown sugar and sesame seeds. Like seriously guys, is that not the best combination? It looked and tasted just as good as it sounded! Paul opted for omelette which came with the proper American-style breakfast potatoes. Of course, since I’d dragged Paul half-way across the city in search of the best pancakes in NYC, we couldn’t leave without sampling them. 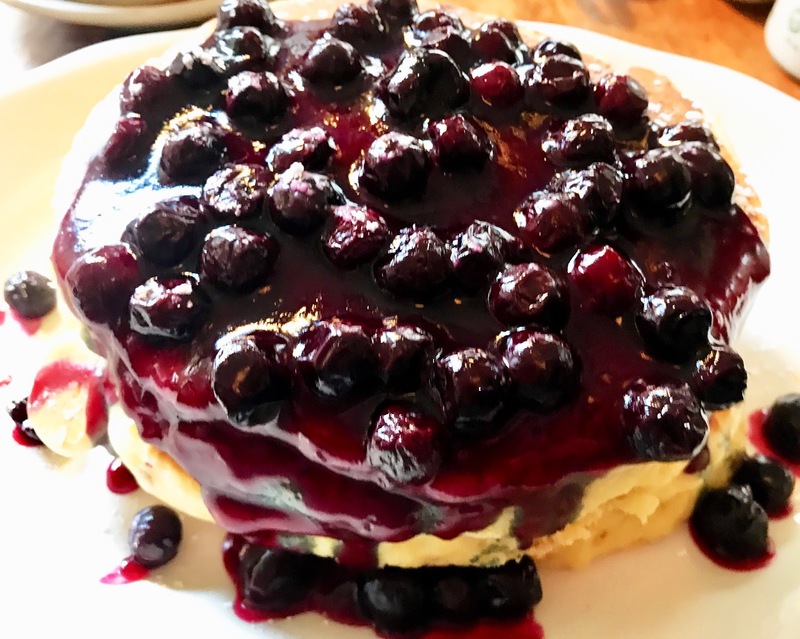 After listening to the people at the next table talk about how they were the best pancakes in NYC, coupled with seeing them arrive at the table and literally wanting to dive on their table and devour them, we ordered blueberry pancakes to share. They were literally incredible! I mean, I know everybody always says best pancakes ever, but these actually were the best pancakes ever! We drowned them in maple syrup (which was also incredible by the way) and completely devoured them. So, the moral of the story is that it is always worth a subway trip to the other side of the city for the best pancakes in NYC. I’ll definitely be back to Bubby’s NYC for more breakfast goodies next time I’m in NYC and hopefully Paul will be hop skipping along with me next time. Have you ever been to Bubby’s NYC? Let me know your thoughts. What are some of your favourite breakfast places? Looks like an amazing breakfast spot. I am going to have to add this to my list for my next trip to NYC. You definitely should! It is most definitely one of my most favourite breakfasts I've ever had. Try the chocolate chip pancakes! It's incredible, definitely worth trying! Why didnt I go here when I was in New York!? Im going to have to go back now! That Autumn oatmeal sounds great, the pancakes are beautiful and I would have had English Tea too! You missed out. The perfect reason to go back! These look absolutely delicious, will keep it in mind for when I visit New York! They really really were! It's worth the visit! It looks so yummy, one day if I visit NYC, I have a good idea where to have a good breakfast. Haha it is so true that it is hard to find someone who appreciates our need to photograph everything LOL. I have to say though that is definitely what I would call an amazing birthday blowout and those pancakes are definitely calling my name! Haha I know right, why can't they just understand? The pancakes were insane!! Wow that's a good pancake story, and indeed worth it especially when 8t is really good! My case, i even travel to the next city just to order that vegetable samosas I always wanted. Ha..ha.. I can understand how difficult it might be to explain some people about 'instagrammable' breakfast!Thankfully my husband helps me with my blog photography so he totally understands this aspect! The pancakes look so delicious an truly instagrammable! Looks like such a fun place to visit! The food is making me hungry just from looking at it! Definitely instagramable pics! I've been to NYC many many times for business trip! I wish knew Bubby's when I visited New York! Looks perfect place to have breakfast! I'm snug pancake girl and those look so delicious! Those blueberry pancakes are to die for. It looks so delicious I am drooling right now. I was in NYC a few months back but I missed having breakfast at Bubby's! I should remember this next time. Omg Bubby sounds incredible! I’m heading to ny at the end of the year and definitely want to find some great eats. Those pancakes are def on my list to try. Wow! What a lovely breakfast to start your morning. It's so delicious! The pancakes look delicious, next time you are in US try going to ihop they make amazing pancakes. I live in the city and never heard of this place. Will definitely check them out. Damn, I can't recall ever seeing better pancake in my life. You better believe I've bookmarked this to the moon and back!